Blogging has allowed me to "meet" so many wonderful people. Several years ago, I found Susan’s original blog and we became friends. The two of us would write comments on each others posts, we would e-mail each other and even chat on Twitter. Our oldest boys are both the same age, so we help each other virtually as we sent our boys off to kindergarten in September 2009. I also recall Susan mentioning more than once that she wanted to take a step into the business world. Recently, Susan made this dream a reality with her Barefoot Books Marketplace. I first heard about Barefoot Books through Susan when she started to do her research. The books looked fabulous. As a teacher ,I am a book addict. I dare say I have a collection of picture books that I started when I was in college, even before I did my student teacher. My Children’s Literature course made me really appreciate the talents of various authors and the gifts that the illustrators add to their books. Welcome a new baby into the world with a hardcover edition of Baby’s First Book, featuring Clare Beaton’s exquisite hand-sewn collages. Paired with a cuddly White Bunny Rabbit puppet, this gift set makes the perfect present and is presented in an eco-friendly, reusable green shopper tote with a gift tag to personalize. As someone that often needs to give baby gifts and other items to young children, I appreciate that Barefoot Books has gift sets like the one that we received. You could tell that a lot of thought went into the items that were included. The tag alone made it such a personal gift. The boys immediately claimed the rabbit puppet as theirs. Of course, we also read the book together. Each page was filled with the illustrations by Clare Beaton that allowed for a lot of discussion. The boys were able to repeat the nursery rhymes with me, tell me what the clothing was depicted, make up a story about the bears (seen above), or repeat the animal noises. There was a wealth of things that we could add to this book, especially with my two year old. I must admit that I was partial to something with Baby’s First Book. 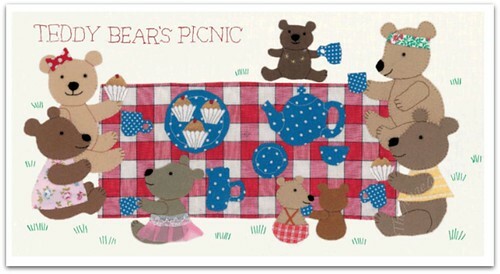 I adored Clare Beaton’s illustrations. Not only did the author do them herself, they were actually hand-sewn. As a teacher, it looks like a felt board story was done with extra detail on each and every page. I could actually see framing some of the pages from this book in a nursery for a child. Yes, they really were that gorgeous. Beaton is a very talented artist. When I looked over the catalog from Barefoot Books I realized something else. I had read several other Barefoot Books. Just a few weeks ago NHL took The Beeman by Laurie Krebs out of the library. We all loved the details about the world of bees and beekeeping, along with the amazing illustrations by Valeria Cis. There were other books that I also recognized. 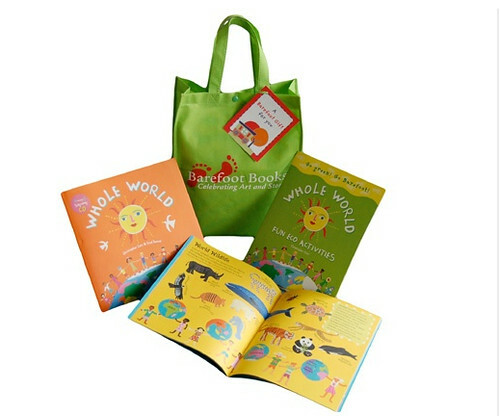 How would you like a chance to win the Whole World Gift Set from Susan and Barefoot Books? The set seen above is being given away on Susan’s Barefoot Books blog to celebrate Earth Month. Head on over to see more details about the gift set and to enter the giveaway. 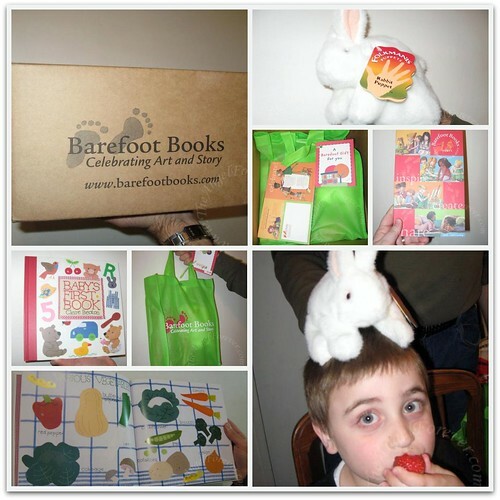 Have you ever received or given Barefoot Books? If not please head on over to check them out at Susan’s Marketplace. Disclosure: I received the Barefoot Books set complimentary of Susan to facilitate my review. The opinions expressed are 100% mine about the product. No other compensation was received. I have linked to Susan’s marketplace to assist a fellow mother in her new business.